I am a sucker for tacos! I love tacos. Doesn’t matter what you fill them with, it is all good in my book. If there is meat and some sort of fresh produce in the tortilla you really can’t go wrong. These are some of my favorite tacos during the summer because they are relatively easy to make and they are so light and refreshing! The tangy citrus slaw goes great with the spicy chipotle cream. I have made these when having company over for dinner and served them with my cilantro lime rice and some black beans for an awesome dinner. Cinco de Mayo is just around the corner so be sure to mark this recipe and give them a try. And for the ultimate meal, don’t forget the mango margaritas! Note: The shrimp can be cooked in a skillet or over the grille. It is personal preference. If you decide to grille just skewer the shrimp on a kabob and cook for 3–5 minutes at 400º. Place the shrimp in a large bowl whisk together the kosher salt, honey, lime juice, tequila, garlic, cumin, chili and powder. Once the marinade is well mixed add the shrimp and toss to coat. Place the bowl of shrimp in the fridge to marinade for 30 minutes. While the shrimp is marinating prepare the coleslaw by whisking together the lime juice, orange juice, olive oil, and mustard. Add the red cabbage to the dressing and mix until well coasted. Season the coleslaw with salt and pepper to taste. Place the coleslaw in the fridge. After the shrimp is done marinating, heat a large skillet over medium-high heat. Add the shrimp and all the marinade from the bowl to the hot skillet and cook for 3–5 minutes stirring occasionally until all the shrimp are opaque all the way through and are pink/orange in color. Warm the corn tortillas either one by one in hot skillet or all at once in the microwave. To assemble the tacos place a scoop of the coleslaw and 3–5 shrimp (depends on size) in each tortilla. Top each taco with some of the diced avocado. Finish off each taco by drizzling some of the chipotle cream over the top and topping of with a little of the fresh chopped cilantro. Serve with a lime wedge and enjoy! Tacos up! Looking for more recipes like this? Maybe you will love these! Previous postI’m Back, and in a New Kitchen! Funny. 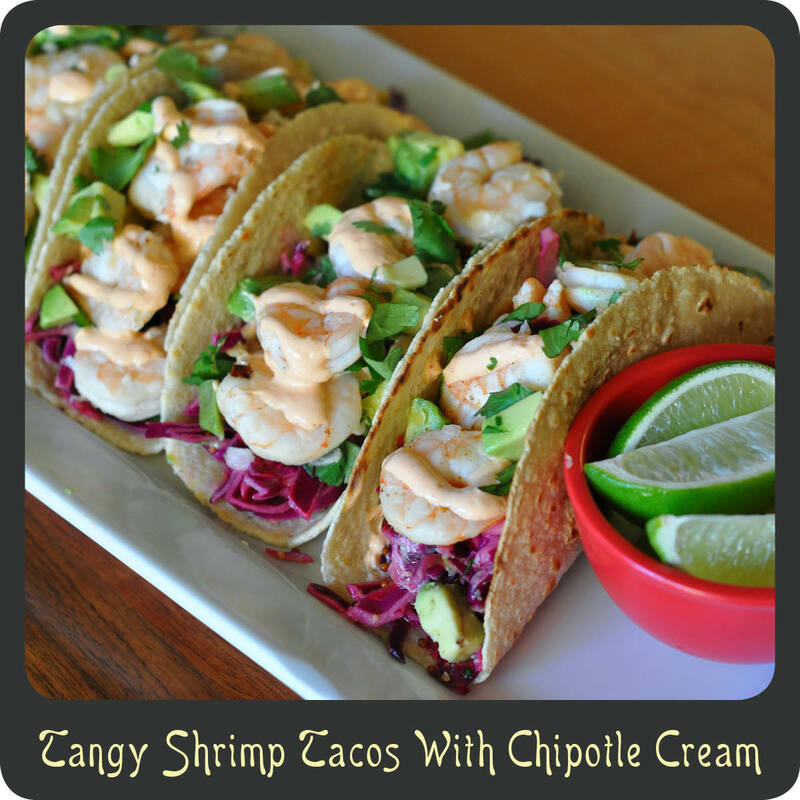 I’ve made tacos with white fish and salmon, but I don’t think I’ve ever used shrimp! I must remedy this quickly! Thanks for the inspiration. Yes, you must! We love our shrimp tacos!